The Creative Chicago Expo is a free, two-day event intended for creative individuals and organizations in design, culinary arts, fashion, film, music, dance, theater, literature, and the visual arts. Through keynotes, workshops, and vendors, the Expo connects Chicago’s creative community with professional development expertise from top local and national providers. The Creative Chicago Expo connects Chicago’s creative community with resources they need to thrive. 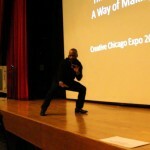 11th Annual Creative Chicago Expo was on Friday, March 14 and Saturday, March 15, 2014. 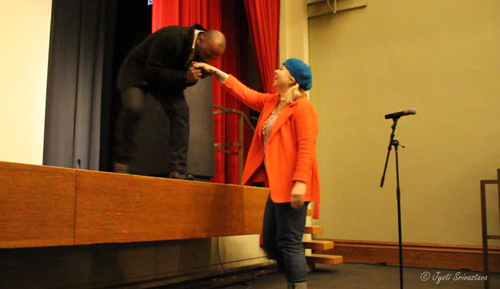 Keynote speakers were performance and installation artist Theaster Gates fashion designer Maria Pinto, chef Carrie Nahabedian and filmmaker Robert Teitel. 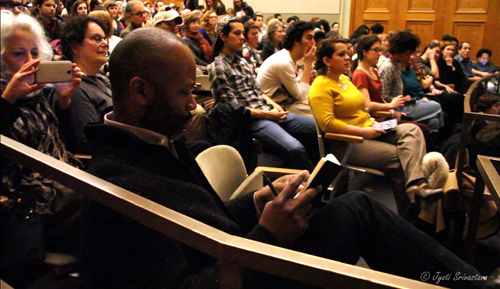 I was most interested attending the speech of keynote Speaker Theaster Gates. 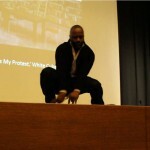 I was really curious about Theaster Gates.. What makes him so popular? What about all the national and international recognition? What about all the projects he is working on? 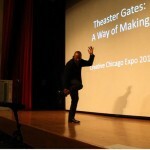 So when I learned that he is the Keynote Speaker at 11th Annual Creative Chicago Expo, I headed to the Claudia Cassidy Theater, to see him and hear from him. Well, my very first impressions, based entirely on the 40 minutes speech he gave.. He connects, he elevates, he provides hope, he provides leadership, and acts as a role model, by being an example himself. He is someone to look up to, to figure out how to make things happen. He motivates to look beyond our narrow interests and to become a productive member of the community. A vibrant thriving community can be greater than a sum of its parts and everyone involved gains from it. And such a vibrant thriving community can achieved by turning around abandoned, dilapidated houses and making them hub of cultural activities. And he is making it happen! He involves everyone in the process.. artists, academicians, bureaucrats, financiers and locals. He is showing a way, and everyone is taking a notice! Bravo!!! 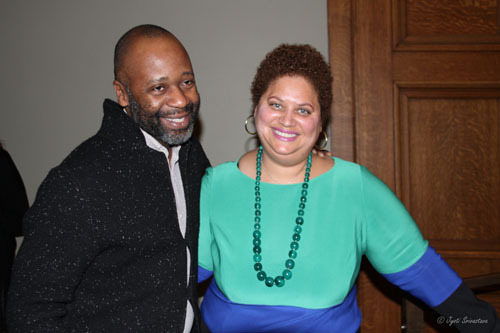 Theaster Gates is the founder of the non-profit Rebuild Foundation… click here.. Rebuild Foundation helps neighborhoods thrive through culture-driven redevelopment by activating abandoned spaces with arts and cultural programming. We transform under-resourced communities by leveraging economic and cultural resources. He is currently Director of “Arts and Public Life” at the University of Chicago. It seeks to build creative connections on Chicago’s South Side through artist residencies, arts education, and artist-led projects and events. For this project, Theaster Gates started the “Arts Incubator project”, which provides space for local artists to grow professionally and connect with the surrounding cultural community. The space used is a renovated building from the 1920s at Garfield Boulevard and Prairie Avenue which had been dilapidated and languishing. It now houses studio spaces for the Arts and Public Life artists-in-residence; the Design Apprenticeship Program, which is essentially a small shop that assists in the beautification of Washington Park; and project and program spaces for exhibitions and events. Theaster Gates is designing the largest public art project in the history of Chicago Transit Authority [CTA], as part of 95th Street Terminal Improvement Project. It is more than just artwork, as Gates is creating a unique, catalyst program that will foster community engagement, provide jobs and offer training to school students. One of his most successful projects have been the Dorchester Projects, on the south side of Chicago. He restored dilapidated buildings and turned them into vibrant cultural institutions with artifacts from south side. 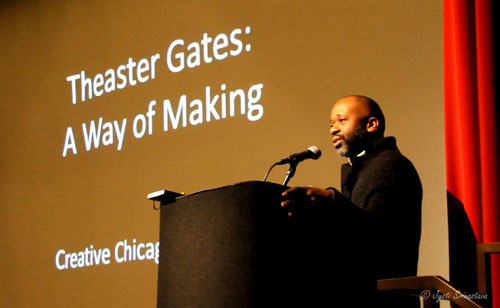 More about Theaster Gates, from the Creative Chicago expo website..click here..
Theaster Gates has an expanded practice that encompasses community development and reuse strategies, performance, object making and critical engagement with many publics. Founder of the non-profit Rebuild Foundation, Gates is currently Director of Arts and Public Life at the University of Chicago. His recent exhibition and performance venues include the Studio Museum in Harlem, New York; Whitechapel Gallery, London; Punta della Dogana, Venice; Museum of Contemporary Art, Chicago; and Santa Barbara Museum of Art, among others. In 2012, Gates was awarded the inaugural Vera List Center Prize for Art and Politics, the Wall Street Journal’s Arts Innovator of the Year, a Creative Time Global Residency Fellowship and became a United States Artists Fellow. Gates has also received awards and grants from Creative Capital, the Joyce Foundation, Graham Foundation, Bemis Center for Contemporary Arts and Artadia. He is represented by Kavi Gupta Gallery in Chicago and White Cube in London. Some excerpts from the above speech..
March 14, 1014, at Claudia Cassidy Theater of Chicago Cultural Center. What an amazing moment that the City of Chicago is recognizing deeply how important artists are. How great a moment , the cities we thought we are second to, or third to, are losing artists, because artists want to be here instead. What an amazing time to be a maker, when the territory for making is much more expanded than it has ever been. We are previledged to make!!! Possibility is one thing. But then, our willingness to have the courage necessary and both the energy and focus necessary to turn possibility into things that actually live, sometimes in the face of tremendous opposition, requires real talk. That an MFA by itself, or a BFA by itself, just doesn’t mean anything. What they are not teaching us in school and what we are not learning, is that art is still about something that comes from our hearts. That it is not a business. That if we treat it as a business and the business is not working, we will stop making. The best way to ensure a sustained art practice is to make, because you believe in making. I have dealt with constant NOs. No, that is not possible. No, it is not feasible. No, it is a waste of your time. No, it is an albatross. No you will burn out. And all of the above is true. It requires that we dig deeper and harder than anyone else, to make things that we believe in, happen! So I keep thinking about possibilities and miracles. Maybe a miracle is something like belief plus work. I have known very early on that faith alone is dead. Faith without works, faith without action is nothing. So for the south side, west side and far downtown, I have a lots of hope , lots of faith, and then I still willing to roll my sleeves up very early in the morning and work till very late last night, to have things manifest, so that our city is much better than it was when I woke up. In the absence of museums, opportunities, we make galleries in our houses. We have temporary fairs. We have counterfairs to the major fairs. We invite each other over and have grits. We try to make way out of noway. We figure it out. Meet the DCASE team [with videos]..and hear them introduce themselves.. click here..